Stroll, ride or run along The Chuck Huckelberry Loop and you’re likely to spot more than desert vegetation, wildlife and fellow users. On the Rillito River Park, a whimsical steel sculpture of bats on bikes pays tribute to the Campbell Avenue bridge where bats roost. A three-panel tile mural created by local students can be found along the Santa Cruz, offering a historical homage to the Spanish Explorer Juan Bautista de Anza and Jesuit Missionary Padre Eusebio Kino. And a sculptural arch spanning the Julian Wash — Joining Hands — tells the story of people coming together in a joint enterprise. Users are able to enjoy these — and more than four dozen other pieces of art along The Loop — thanks to the Pima County Board of Supervisors longtime support of a Pima County Public Art Program. The Board established the policy back in 1990 to allocate one percent of the cost of public works’ projects on public art. Some of the works you’ll see along The Loop are not part of the Public Art Program, but instead are generous donations by civic-minded Loop lovers. Art helps shape the quality of life for people in Pima County by offering a form of expression that embodies our community’s spirit. It also attracts people who bring a broad array of talents and experiences to this community. Expand each River Park segment below to view the artwork along the path and its corresponding location. Numbers below correspond to the artwork's numbered location on the map. If you’re out walking or riding the Loop, look for these icons (pictured) on the pavement to direct you to the artwork found in this map. Enjoy! Download a PDF of the Loop Art Map. This playful steel sculpture of a bat on a mountain bike is the third in a series showcasing the role of roosting bats under the bridges along The Loop. Stair-stepped shapes paired with an agave cactus form create a wave motion on this 400-foot bridge, providing continuity with the wave theme found on related projects along the corridor. The large rammed earth doorway is made from local soil and Portland cement. The two bronze key panels that grace the top of the structure were created by 200 youth from Flowing Wells Jr. High and High School. This circular structure built of concrete block and flagstone features eight interrupted curving walls create a kiva-like circle. Six of the walls have small ports oriented toward sunrise and sunset at the summer and winter solstices, and the spring and fall equinoxes. Commissioned by the Thomason Family, this sculpture is the centerpiece of an expanded memorial wall and garden. The Pima County/Tucson Parks and Recreation Civic Arts Project brought together 765 children from the community to create each component of this sculpture under the guidance of Joe Ventura. Funding was provided through the Federal Recreation Summer Program. A large steel bench in the form of a horseshoe is painted the color of aluminum. Anchors in the shape of giant horseshoe nails serve to anchor the bench to the ground. A tower of open steel parabolic arches narrows from its circular base to its top. Sixteen steel cut-out figures play and climb among the arches from the base to the top of the tower. Powder-coated yellow poles feature bright yellow metal circles at the top. Varied colored handmade ceramic tile bands encircle the lower portion of the poles, representing activities that take place in the Park. The sculpture is created in aluminum and steel that has been submerged in concrete. The sculpture is powder-coated and cold connected. Three life-size hawk sculptures with an incised feather pattern are mounted to angled steel poles. The metal railing and gateway bridge include angled tops in mountain-like forms. Various small shapes are welded into the fencing including leaves, flowers, wrenches, and ratchets. This whimsical steel sculpture of bats on bikes pays tribute to the Campbell Avenue bridge where bats roost. Catalina gneiss, a distinctive mixture of two colors of granite, was used to create these benches constructed of several boulders fitted together and two additional boulders that define a larger seating area. The benches face north to capture the view of the Catalinas. The Shindigger Blue name was inspired by the Shindigger cactus, whose name amused the artist, a native of Indiana. The sculpture addresses aesthetic concerns that deal with balance, composition, kinetics, spatial relationships and a sense of spirited life. Two young children are perched upon the back of a grazing horse. The boy seems to be totally into the moment, while the young girl is taking it in stride. 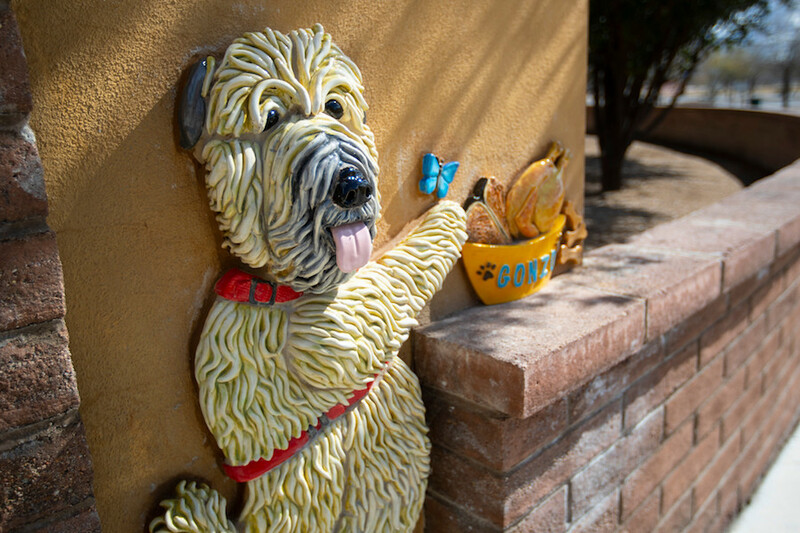 “Gonzo,” the beloved family pet of the Fenton family for whom the park is named, is immortalized in this playful pose. Two life-size children (boy and girl) read a book together on a small park bench in this high-quality American bronze. This metal sculpture pays tribute to the park’s namesake and her love of butterflies. The bridge design is influenced by the artist’s work, allowing the bridge form to appear to grow out of the wash.
Four chaise lounge chairs composed of steel and polished cast concrete include a cast concrete table with either a game board top or cast objects (coffee cup, newspaper, towel, drinking glass) of concrete or bronze. A restful 30′ x 25′ garden with Palo Verde trees, plants, stone seating, bronze and stainless steel sculpture. This combination of cascading rain and raindrops shows the abstract movement of water using 2,000 iridescent glass marbles and broken tile. The raindrops are circles of broken tile with marbles inside. Hand-forged steel bars in the shape of a Y are anchored in reinforced concrete. One of three natural boulders features a hand-forged steel relief of agave and dome. CNC—routed curvilinear panels in two subtle shades of blue appear as a flowing stream of water, adding vivid color to the already-sculptural form of this arched bridge. Students from Desert Christian High School, St. Cyril School and Dodge Middle School came together to create this work. The design is reminiscent of a cathedral window, with a vegetative pattern on the lower section tying into the natural world. The star shape is based on the Arizona flag. This bat on a bike pays tribute not only to the Broadway bridge where bats roost but also to the thousands of cyclists who pedal along The Loop every week. Realistic -- albeit very large -- animals and abstract/geometric stacked shapes share space. All of the pieces accomplish their purpose in providing signage and attracting attention to the park. The Memorial Tree Park is divided into seven gardens, each with its own map depicting where a memorial tree may be found. The Children’s Memorial is a semi-circle of panels with the “tree of seasons” shown. A sculptural arch spans the path, with two sculptural “greeting” figures, drawn from Hohokam pottery, on either side of the path near Kolb. The project tells a story that unfolds as walkers and bikers move through the scenery, a story of people coming together in a joint enterprise. Desert flowers and mountains grace this tiled piece along the Julian Wash in the midst of our own desert landscape. 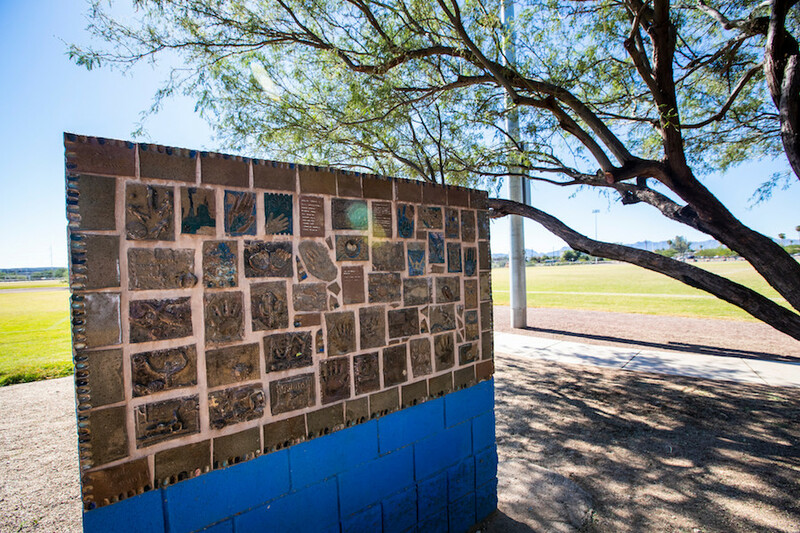 A violin player, a mother and children and other cultural symbols of life in South Tucson come together in this tiled piece in the area’s first neighborhood park named for Carmelin Castro, who proudly served his Yaqui community. Animals and reptiles of the desert are depicted in these small tiled pillars along the Julian Wash.
Students at Pima County’s Las Artes Arts and Education Center crafted this mural to pay tribute to the park’s namesake, a dedicated participant and leader of Yaqui religious and cultural ceremonies and a revered elder of the Pascua Yaqui Tribe. Metal embellishments on handrails and pavement design honor the importance of the sun in both the Yaqui and Mexican-American cultures. The ramada serves as the beginning point for the Julian Wash Cultural History Walk, a timeline representing the many cultures that have occupied that particular site in the ancient and recent past. Intaglio designs used for the form liners of the concrete retaining walls were taken from the tire tracks left in the riverbed. A pattern of oblique angles and wide “V” shapes are repeated in the patterns that vary from 2 feet to 12 feet in height. Rescued from a County storage facility, this vintage 1950s concrete frog was given an updated coat of paint to look like a native Great Plains Toad, a species which is found onsite at Paseo de las Iglesias. This custom gable to a pre-fabricated ramada that showcases native birds and plants in layers of cut and powder coated steel. The piece is a concrete etched entry monument with inset sandstone carvings of native animals and plants along with haikus on the reverse. An LED coopers hawk luminaria sits atop the monument. This piece is a three-panel tile mural created by Las Artes students, which is themed with imagery of Spanish Explorer Juan Bautista de Anza and Padre Eusebio Kino. Images come from archeological digs through time. Reproductions of Hohokam village artifacts appear on the lower wall. Memorials and message tiles were made during community workshops. Leaves, dragonflies and the many users of the Loop are depicted in several mosaic murals. All are part of the Ben’s Bells effort, a program dedicated to promoting community kindness. The rich verdant land of the Santa Cruz River drew people to settle and farm here millennia ago. The integration of artistic themes on the bridge gives due reverence to this once perennial river that sustained and nourished countless generations before rapid population growth. The dominant feature of the plaza is four rammed earth sculptural monoliths that face toward the black volcanic mountain now called Sentinel Peak. Design elements include a ‘spirit’ line, plaza, and seating. The depiction of the Last Supper features statues all made of concrete, sand, and debris recovered from the Santa Cruz River. The piece was moved to its current location in 1982 as a part of the Santa Cruz River flood control improvements. This archway was originally part of three garden installations completed in 2000: Acacia, Willow and Mesquite. In 2016, due to land settling, the tiled archway was moved to its current location. The entry mural sits in an elevated arch of used brick. Low concrete walls run the length of the park in seven separate sections. Ceramic tiles create a narrative of historical events in the nearby barrios. The design was sketched onto the concrete and then incised lightly into the existing pavement of the plaza next to the baseball fields. The shapes were cut by hand using diamond cutting wheels and an angle grinder. The bridge railing encompasses the past, present and future of the Santa Cruz River by featuring desert blooms, flowing water, people from past, present and future communities, cottonwoods, snakes and birds that once populated the area. The bronze sculpture features a boy and girl reading on a log that’s emblazoned with the words “hope” and “love.” The butterflies pay tribute to Christina-Taylor Green’s love of butterflies. Students painted two quail flying over a mountain landscape. A large steel butterfly perched on top is from Christina-Taylor Green’s last drawing. A bronze mountain lion sits atop a rock-like platform with ceramic tile mural. To create greater awareness and appreciation of wildlife issues, this Troop designed, built, and installed this monument, featuring inspirational quotes, metal animal silhouettes, rebar frame, river rock fill, and a registry where visitors can leave messages about wildlife. Early pioneer children make their slow journey across plains and through fields. In a world of fast travel and too many conveniences, Family Ride expresses a gentle slowing of pace and a patient acceptance and understanding of the beauty of waiting. Steam Pump Ranch was an important way station for those traveling on horseback from the Florence/Eloy/Casa Grande roadway area into the Tucson Basin. This piece is meant to carry on Oro Valley’s goal of offering hospitality to all. Originally a cattle ranch, the site for this piece features metal leaves, stems and flowers designed in a ‘tooled’ leather fashion harkening back to the ranching days. Each of the five sculptures depicts various growth stages of the datura plant from early flower buds to fruiting structures.